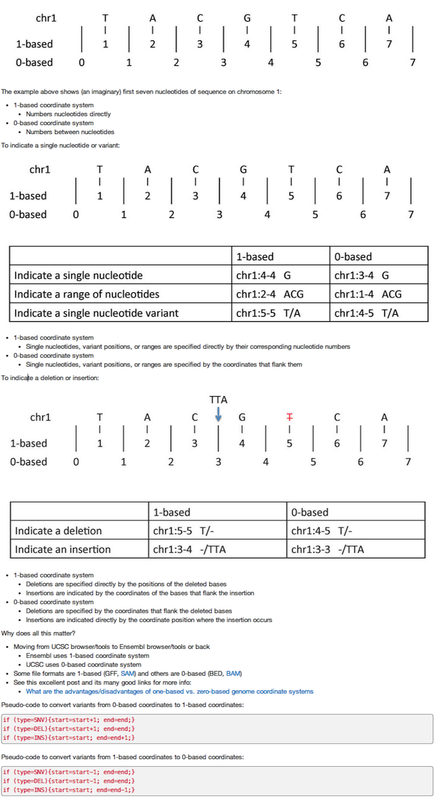 Obi Griffith over at Biostar put together this excellent cheat sheet for dealing with one-based and zero-based genomic coordinate systems. The cheat sheet visually explains the difference between zero and one-based coordinate systems, as well as how to indicate a position, SNP, range, or indel using both coordinate systems. I was just wrestling with this myself! I had a bug from not realizing that bed was 0-indexed. These are insidious bugs.